There have been a few things in class over the last week that have resonated deeply and left me thinking about myself, observations that have changed me, and what I represent to other people. Susan Erikson said something about thinking about ourselves as an icon. What are we to other people? It made me think about an encounter I had with a young South American woman at the Highland Pub years ago. I worked at the student pub here at SFU throughout my lengthy undergraduate degree. I feel that I received far more of an education in that pub, drinking beer with my fellow students, than I did in any class I ever took. The diversity of perspectives I encountered was tremendous. Math guys, stats girls, Marxists, English students with Goth makeup and sparkly nail polish, edgy business majors, dusty archaeologists, and thoughtful philosophers, humanists, and sociologists. The discussion I had with this young woman started out innocently enough. We were discussing racism. I thought I knew what racism was and I thought I had some deeply reflective things to say about it. I suddenly felt the need to defend myself, but instead of engaging in an academic debate about the nature of racism, I found myself listing everything hardship, stumbling block, embarrassing moment, and trauma, as if they would redeem me from my status as an oppressor. I realized what I was doing and sat back and thought for a moment. I suddenly saw myself through this girl’s eyes. Really saw myself. I saw the power she felt I had. I felt angry and judged. In the realm of the pub, I was someone everyone knew and respected. I did have power there, but I felt that I had earned my status in this space. I had worked hard, was a nice person, a good employee, a diligent student. At the time, I was angry, hurt, confused, and probably a bit inebriated. I abruptly excused myself from the table and went home. I felt bothered by this exchange for days. At the time I really had no idea I had any real power of any kind. I had never considered myself in the context of my skin colour. I had come from a lower middle class background. We had enough, but not a lot. I grew up in Prince Edward Island (PEI) , which is a fairly homogeneous community. Small, isolated, and aside from a small community of Lebanese people who had settled in the Maritimes, and mostly white. I few weeks later I saw this girl again. 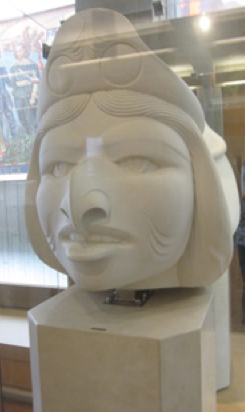 She has set up an overhead projector in the hallway of the AQ at SFU, with the light shining on the face of the Dogfish woman sculpture by Bill Reid. She was using the projector to draw on the Dogfish woman’s face. She had placed herself in a very open space and from what I could tell she was trying to make a statement, a big, quiet, bold statement about this sculpture and what it said to her. About her. I suddenly felt her pain. I got what she meant when she said I had power, and was obnoxiously unaware of it. I was the oppressor because I didn’t even know I had any power. It was ignorant, dismissive, and sad. I hadn’t thought about this girl in a long time. The session we had with David Hatfield yesterday brought back those feelings of awareness and sadness. What struck me about the conversation yesterday is that a lot of people, including myself, are still not really aware of the full extent of the power we have and how to use it or how to be be mindful of it. Being reflective of how our positions and status in the world affect others is no easy task, one that is not discrete and really has no end. I was very moved by the discussions we had in class yesterday and I found myself hugging someone in the hallway afterwards. I hope the process we went through will have a lasting effect and work to build a finer balance between our varying perspectives. This entry was posted in Blog Reflections, Guided Questions: Reflections on Learning, Observations & Reactions to Readings and tagged Bill Reid, Canada, david hatfield, Maritimes, Prince Edward Island, SFU, Simon Fraser University by thughesa. Bookmark the permalink.